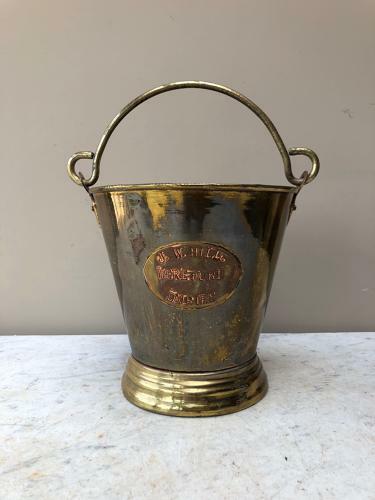 Late Victorian Brass Milking Dairy Pail. Plaque to the front J W HILL. HEREFORD DAIRIES. I am always really dubious when buying these milk pails as there are a few reproductions but looking at this pail..the wear is correct underneath and inside. There is a small split at the top rim at the back and the base at the back. It is just very slightly misshaped at the top and it does have dings all as it should do. There is aged patina around the plaque. See the many photographs. The height measurements are with the handle up. With the handle flat is measure 22cm high.